It is with great sadness that we learned that Emmon Bach died on November 28. The website http://emmonbach.info is a place for sharing memories and contains many pictures from the Emmon Fest in Frankfurt just a few months ago. 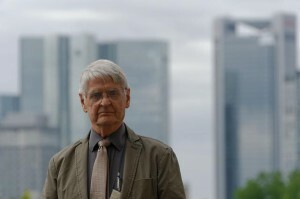 Emmon’s colleagues from SOAS have have posted a Tribute to Emmon Bach. An obituary has been posted on the Language Log. November 27th to 30th, the Research Group Relative Clauses hosted a workshop on relative clauses, sponsored by the Strategic Parnership Program (DAAD) and the Research Group 1783 (DFG). The aim of the workshop was to intensify the scientific cooperation between Tel Aviv University and Goethe University Frankfurt. Sascha Bargmann (Frankfurt): About bear services and flabbergasted building blocks – Applying Soehn’s idiom theory to English data. Gert Webelhuth (Frankfurt), Sascha Bargmann (Frankfurt) & Christopher Götze (Göttingen): Idioms as evidence for the proper analysis of relative clauses. Christopher Götze (Göttingen): On Jacobson’s and Barker’s analysis of binding-theoretic reconstruction effects.